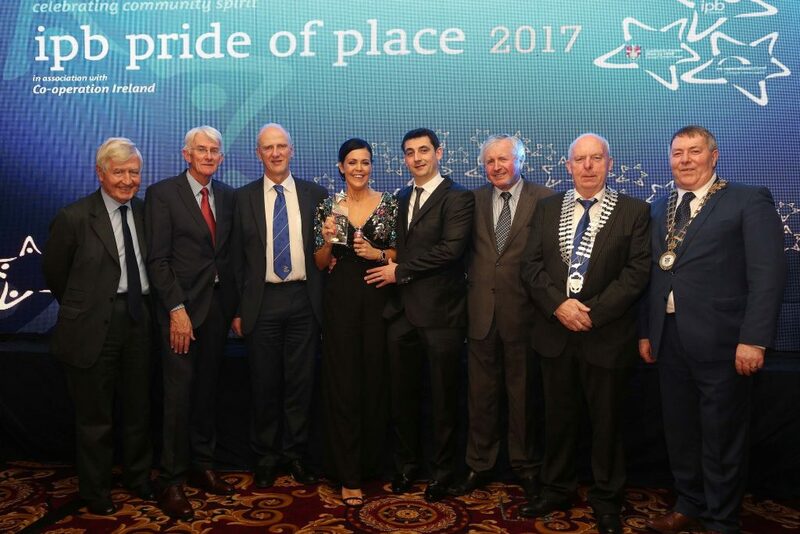 Co-operation Ireland Pride of Place Awards Ceremony 2017. Representatives from Erica’s Fairy Forest receive their Special Award. Included are Dr. Christopher Moran, Chairman Co-operation Ireland; Tom Dowling, Chairperson, Pride of Place; Cathaoirleach of Donegal County Council, Cllr Gerry McMonagle; and, Michael Garvey, CEO IPB Insurance. Minister, distinguished guests, ladies and gentlemen. It is, as usual, a huge privilege for me to be here tonight particularly as, despite the accent, I have family roots in Donegal. This is one of the most anticipated calendar events of the year for Co-operation Ireland and it is for me a real joy to come each year and share in the celebrations of achievement, which stretch the length and breadth of Ireland. It would be remiss of me not to mention, the former Tánaiste, Frances Fitzgerald who has been a staunch supporter of Co-operation Ireland and a personal friend to me. Frances was to be here tonight but events overtook matters therefore I would appreciate it Minister McHugh if you would pass on my good wishes and my hope that she returns to office in the not too distant future. I can think of nowhere is that better reflected than here tonight at the Pride of Place Awards – where each of you has in your own unique and selfless way looked out for one another so that the lives of all may be enriched and bettered. The competition has come a long way since 2003 and each year the entries grow and quality of those entries are simply amazing. I would like to pay particular tribute to Tom Dowling, Chairman of Pride of Place for his unstinting commitment to this project. Your leadership has been inspiring to so many local communities. I would also like to thank IPB Insurance for their sponsorship. More and more companies, like IPB are engaging in corporate social responsibility that brings them closer to local communities and there is no competition in either the Republic of Ireland or Northern Ireland that reaches right into the heart of communities in the manner of Pride of Place. Pride of Place is centred on the people and organisations that are making a huge effort to shape and change their local communities. In some cases its physically brick by brick, but mostly its about reaching out to those within our communities and letting them know that they are both valued and valuable to their neighbours and friends. This is so important in an age where official community support structures sometimes fail to be as embracing as they should be. And so it often falls to local people to step up and take responsibility for their neighbourhoods and the people who live there. It’s about people taking pride in their place. In all parts of Ireland –North or South neighbourhoods are more culturally and ethnically diverse than ever before. And these neighbourhoods can best thrive when all the talents of the community are at their disposal. My board in Co-operation Ireland is very much like your communities. It is a kaleidoscope of diverse and different political persuasions that collectively work together for the common good. Pride of Place is about local people being proud of their heritage, proud of their sense of place, proud of their neighbours and proud of their collective achievements. You can actually feel the pride here in this room tonight. It’s alive with enthusiasm and hope for the future. And why wouldn’t it be with such an array of talent gathered tonight in Letterkenny. Chief Justice Sonia Sotomayor of the USA Supreme Court wrote recently that- ‘ As you discover what you can draw from your community in this world for which it stands apart, look outward as well as inward. Build bridges not walls.’ Now as I was looking for inspiration for this evening – that quotation impacted upon me because Co-operation Ireland is very obviously in the business of building bridges within Northern Ireland and between Ireland- North and South. But we are also in the business of optimism. We want people in local communities to look outwards by building capacity within their communities. We want them to always reaching for that which is just beyond their grasp. However, the other thing about that quotation which gives it real meaning is the person who said it. Sonia Sotomayor maybe a Chief Justice in the USA, she may and she may be one of the most powerful women too but she didn’t get an easy route to the top. There was no fancy prep school, or leafy suburbs in her early life but she was still very much shaped by the community in which she grew up amongst. Her parents were two immigrants- her father, an alcoholic was a toolmaker, who spoke no English, her mother a telephone operator. She was reared in a part of the Bronx that was rife with crime, drugs and ganglands. Her father died when she was only nine years of age and she became a chronic diabetic. Her mother who reared her single-handed had a great belief in education. Her mother was always looking outwards. She bought the young Sonia and her brother – Encyclopaedia Britannica and she encouraged them to read and learn. Sonia was not remembered as an exceptional student but she was hard working and she went on first to Princeton and then to Yale. She rose through the ranks to where she is today. Her mother as other mothers often do- turned around the fortunes and destiny of her family by an example of hard work.. However Sonia’s story doesn’t end there- she also went back to the community where she grew up and helped low-income families get mortgages, making them stakeholders in their community and she also assisted projects such a well being and health which allowed communities to take control of their neighbourhoods. Shaped by her environment she went back to help re-shape it too. And this is what you are all doing too. Sonia Sotomayor is like each of you- striving to improve communities, learn new things, putting something back into the neighbourhoods of which you are rightly so proud. Her story is not a Cinderella story but it does prove that change merely requires an open mind and steely determination. Tonight I wish you all every success. I wish what you desire for your own neighbourhoods and communities. And I hope too that you make the effort to meet and make new friends from either side of the border and that you return home even more determined to make a difference to the lives of those who gave your shelter.